As the first phone outside of China with a 'hole-punch' front-facing camera - a largely successful, but sometimes distracting solution to the notch - it's easy to judge this phone on this aspect alone. But the Honor V20 is so much more: with great design and build, a large edge-to-edge display, stacks of power and a battery that goes on and on, this is a flagship alternative that gets (ahem) a hole lot else right too. In the smartphone world almost every manufacturer has gone notch crazy. 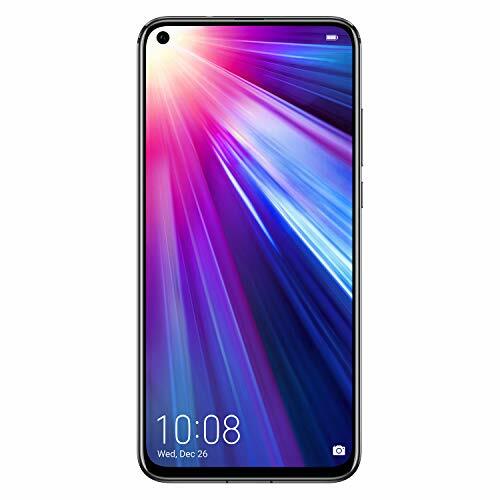 From big notches like the Apple iPhone XS, to smaller dewdrop-like ones on the Huawei Mate 20, through to some makers shunning the idea entirely: the Xiaomi Mi Mix 3 has a slider mechanism to pop-up its front-facing camera, while the Vivo Dual Display has (as you might've guessed from the name) screens both front and back. Which brings us to the Honor View 20. At first glance it's impossible not to notice that 'hole-punch' black circle to its display's upper corner. That, indeed, is this phone's answer to the notch: ditch it entirely, for a not-too-obtrusive front-facing camera contained within its own circular space. While this camera is the View 20's headline feature lure, this phone has plenty more to shout about too. In early 2018 the View 10 impressed us with its performance considering the price - the View 20 takes that up a notch and shakes it together with some new design prowess too. Having been living with the Honor View 20 for over a week as our day-to-day device, here's what we make of this feature-first phone. The Honor View 20 ushers in a new screen compared to other recent elongated flagship devices. Although its 6.4-inch panel sounds nigh-on the same as the 6.39-inch ones used in the Huawei Mate 20 Pro and Samsung Galaxy S9+, there are a number of differences: first, the Honor panel is LCD, not OLED; second, it's a broader aspect ratio, so it's larger and sits wider in the hand. Thankfully it's not a panel that's too wide, unlike the outgoing Apple iPhone 8 Plus. We've found the View 20 to feel just right in the hand, while its high resolution panel expands some applications beyond what you'll find on slimmer devices: South Park: Phone Destroyer, for example, has a wider view onto the field of play than we've seen on any other device (it's quite strange, but interesting how the game is interpreting this scale and resolution as greater due to lack of notch). So what about the absence of the notch and inclusion of that 'hole-punch' camera? Well, it's an interesting idea as full-screen apps don't necessarily stop shy of this circular back-out. Instead they extend beyond it, which can be a potential hazard in some situations - namely when there's an 'x' to close an advert right in that spot - but otherwise it's generally not a problem. Ultimately most apps and the software ignores the camera as if it's not a notch or even there at all. The main issue we've found with this front-facing camera is that it can be distracting: when there's a white background your eye can be drawn to it, as if there's something on the screen by accident. Sure, a notch has a similar issue - but as that's to the very edge and doesn't have screen surrounding it on all sides, it's less distracting. It's not all about screen, of course, as the View 20 takes its own twist on design aesthetics. Over the years Honor has been establishing its brand and frequently a blue finish has been at the fore - typically hyper glossy and light-catching in a visually interesting way. The View 20 follows a similar path, with V-shape patterning to the rear that catches light. But, as you'll have noticed from our photos, our review phone is a bold red. It's a fun look - although blue and black variants are available should you prefer. Build quality is decent, too, with an aluminium frame ensuring rigidity. There are metal buttons, the rare sight of a 3.5mm headphone jack (hurrah), a functional rear-facing fingerprint scanner (it's a little too high set for our liking, though, and we miss having an in-screen scanner), while the protruding cameras to the rear have been polished beyond their 'blue Minion'-style appearance on the View 10 - in this V20 their separation into main sensor and time-of-flight/LED flash makes for a far better composition. On the hardware front the Honor View 20 isn't a million miles away from its Huawei Mate 20 Pro cousin (Huawei owns Honor, so that's no surprise). Under the hood there's the Kirin 980 octa-core chipset - which has 'big' and 'little' cores for different tasks, supplemented with an equal total of 'mid' cores to balance the workload and conserve battery life - alongside 8GB RAM and 256GB on-board storage (a 6GB/128GB variant may also be available). There's no microSD card slot here, though, only dual SIM slots. That's a lot of power in a handset at this price point, meaning games, work and all your favourite apps will spell no issues. But that's seemingly becoming more the norm: look at the Pocophone F1 from Xiaomi, or even the OnePlus 6T, and there's no shortage of devices with flagship specifications for 40-50 per cent less cash than the established Samsung and Apple elite. One area where the Honor View 20 looks to differentiate itself from its Huawei Mate 20 cousin is with its software, which has 'transformed' into Magic UI 2.0. By which we mean in name only: the software is essentially Huawei's EMUI 9.0 re-skin over Google's Android Pie 9. Even the Honor Magic 2 smartphone didn't run Magic UI, oddly, but we think this is a step change in Honor trying to differentiate itself from its Huawei parent. We won't go into masses of software detail here - we've got an EMUI 9.0 tips problems feature, which ticks those boxes - but needless to say the re-skin of Android brings its share of ups and downs. On the upside there are useful features like App Twin for doubling-up apps relative to SIM card, for example. On the downside, some of the fussier alerts and pre-installed software will irk Android purists (but many won't even notice it as a problem - as the hardware load-out means everything runs smooth and fast), while duplicate apps for things like Calendar, Clock, Music, etcetera, might cause a few hiccups for those swapping from a different brand of phone (as you'll end up with both, which is confusing, and a conflict of Android). For logging into the phone there's also Face Recognition, which uses the front camera to map your face for a relatively secure sign-in. It's a solid idea - and one that'll likely be popular in the absence of an under-the-screen fingerprint scanner. Having got used to such a scanner in the Mate 20 Pro it's a shame this Honor doesn't include it - especially as the rear-positioned scanner is a bit too high up for our liking. On the battery front there's a 4,000mAh cell on board, which is similar to that in the Mate 20 Pro (it exactly matches the Mate 10 Pro's from the year prior). Its performance is stellar, too. On fairly light use days we've been getting through 12 hours of use with the battery only dropping by 35 per cent (leaving 65 per cent in charge). When gaming more heavily at weekends that figure has dwindled, but even mixing up a whole variety of apps for a number of hours has seen the V20 last through the necessary 16 hours no problems, with energy to spare. One evening we forgot to plug it in to charge and still woke up the next morning with 45 per cent remaining, so it's a potential two-day battery. There's also a 5V fast-charge via USB-C for rapid top-ups (not the very fastest going, but still good to have present). No wireless charging to be found here, but that's a given a this price point. Cameras in smartphones have become a bigger and bigger deal with each year (sometimes becoming a bit ridiculous, to be honest). We have been treated to some spectacular offerings though: from the Huawei P20 Pro and its triple camera solution, to the Google Pixel 3 and its software mastermind Night Sight. The Honor View 20 goes all out in its own way too, with a 48-megapixel snapper on the rear, paired with a large sensor (well, large-ish for a phone) and fast f/1.8 aperture. That's a lot of resolution - more than in any other phone at present. Only Xiaomi has been teasing its future use of such a resolution, which would suggest the sensor is, indeed, sourced from the same maker (that'll be Sony). We've pointed out that the Honor View 20 is a dual camera phone to its rear, but the second camera isn't there to actually output images. Instead this lower-res 'TOF' camera - that's 'time of flight', if you're wondering - is solely there to detect depth, which can be used to create software-based blurred backgrounds in Portrait mode. So how does the Honor V20's main camera handle? Overall the results are pretty good - we were surprised given the overall massive resolution at this scale. But surprised in a good way. Decent light levels result in lots of detail in images. Honor does the standard over-sharpening practice to make this happen - which can highlight image processing artefacts unwantedly, but if you're not looking at these images on a huge print-out or massive screen, rather just the handset, then they'll look plenty good. As the light drops the abilities are somewhat hindered. That's standard for any camera, but especially true of one that's so high resolution. That said, the results aren't too bad. Yes, there's grain in shadow areas, but it's perfectly passable. The camera auto-selected ISO 800 for a Portrait shot of a Luigi toy (it even recognised his face, bless) and that was in rather dim conditions - proving its capable of continuing to function. When things get extra dark there's a great mode called Night. This also features on Huawei handsets and is effectively a hand-held HDR (high dynamic range) mode that takes multiple exposures of different degrees and compiles them into one image. The results stop shadows being pitch black and highlights burning through the exposure. That it can be achieved handheld is great. No, it's not Google Night Sight on the Pixel 3, but it's still very good. Honor isn't quite on par with Huawei's top-spec cameras, but given the price point the autofocus, variety of modes and control and overall results are decent. Not the best on the market, but spot on for this kind of money. The Honor View 20 continues the brand's forward march in the smartphone industry, going one step beyond by ousting the notch in favour of a hole-punch front-facing camera - a really interesting idea that's largely (although not entirely) successful. But that camera sure is a talking point - the likes of which we'll be seeing in different forms throughout 2019. For Honor to get there first is part of this phone's point: this fledgling brand wants you to stand up and take notice. And notice you should, as it's getting a (ahem) hole lot right. With great design and build, a large edge-to-edge display (with nearly 92 per cent screen-to-body ratio), stacks of power and a capacious battery under the hood, the View 20 has plenty of positives. However, with its asking price being on par with the OnePlus 6T, the Honor's lack of an AMOLED screen and in-screen fingerprint scanner might make buyers pause for a moment before committing to buy. The best-known 'affordable flagship' is an exceptional, feature-packed phone. With an in-screen fingerprint scanner, AMOLED screen and solid camera setup for the same money, this is the device to tempt people away from Honor's hole-punch camera offering.